On Brick Lane in the nineteen seventies, on a damp January day like today, it would have been a toss-up between the Liver & Chips at 36p or the Fish & Chips at 27p for dinner, but either way I know that the Semolina Pudding at 6p would have finished it off nicely. 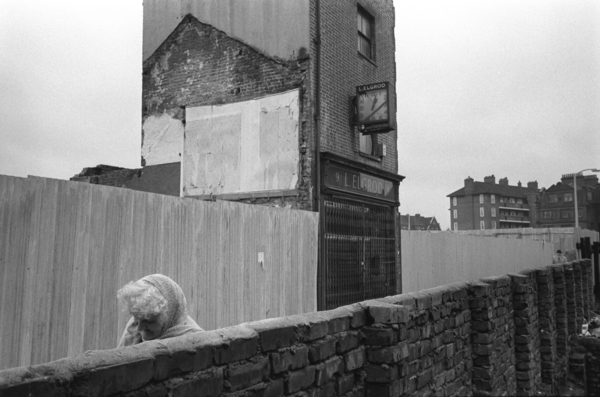 Yet this dilemma will always remain hypothetical for me because I was not there, though thanks to the engaging vision of photographer Homer Sykes I am able to glimpse the lost world of the recent past in the East End. 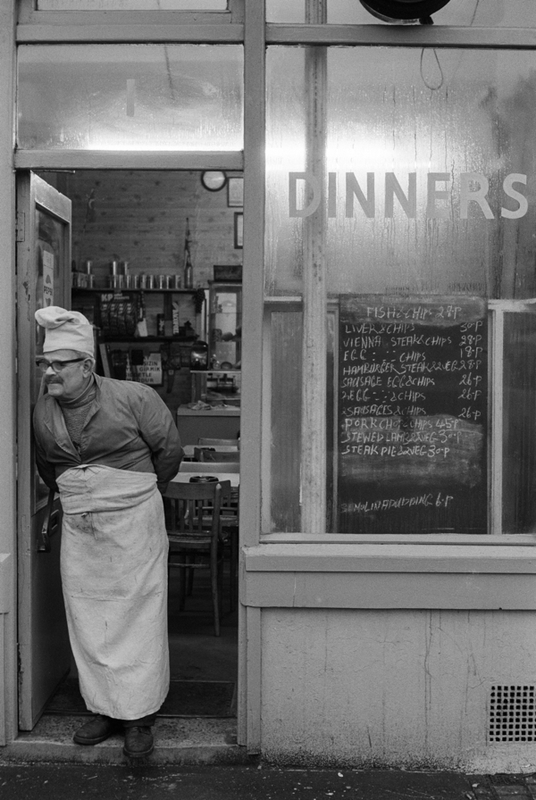 In Homer’s masterly picture, this cook will eternally be gazing down Brick Lane waiting for the next rush of customers, full of eagerness to clear every dish off the blackboard. With his strangely shaped hat and quaint apron, he is like a character from Breugel – and through Homer Sykes’ lense he is transfigured to become the ultimate custodian of the steamy cafe where hot dinners can never go cold. “I was a middle class boy who came to London from Birmingham to do photography for fashion and advertising, and make money,” Homer admitted to me with self-depreciatory ambivalence, “And then I got interested in reportage. Everything in London was new to me, I’d had a sheltered background and I wanted to explore the contrasts between the haves and the have-nots.” But even before he came to study at the London College of Printing, Homer was photographing gypsy encampments in the centre of Birmingham and undertaking photographic road trips around America on greyhound buses. L.Elgrod, watchmakers, the last building standing in an alley off Whitechapel High St, incarnates the dogged persistence of the people here - while the details of clothes speak to us in voices that are no longer to be heard around Brick Lane, whether of the East European cook with his arcanely styled apron buttoned onto his coat, or of the black children so neatly dressed, in frocks with kneehigh socks, simply to play in the yard outside their Peabody flats. “Clothing tells you so much about who people are,” as Homer put it plainly. 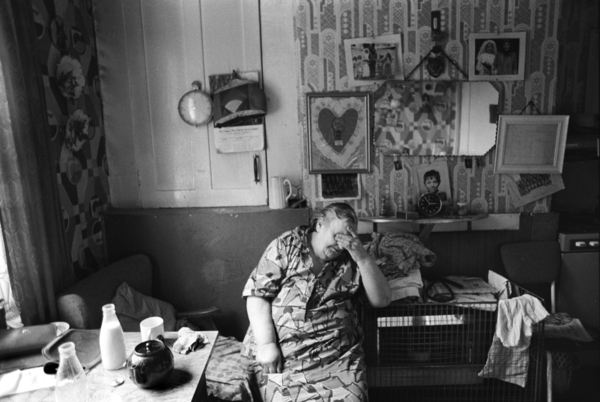 These are unsentimental photographs, filled with human sympathy, yet there is also a classical aesthetic present which gives Homer Sykes’ pictures an enduring quality beyond their importance as social documentary, “All my work is considered, with a sense of formality.” confirmed Homer, “I am interested in composition – the content and composition must go hand in hand. 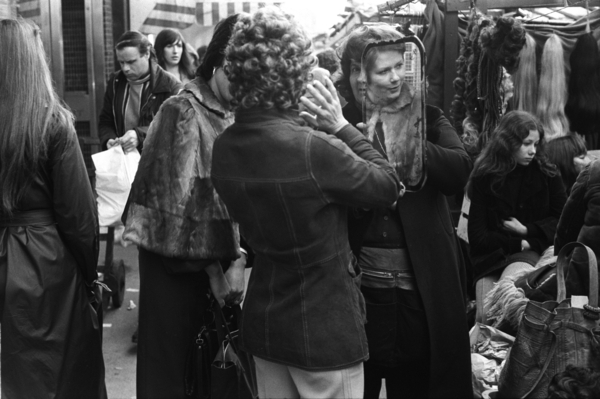 It can’t be just a picture, an extra something is required.” In the selection published here, all are enlivened by unconventional compositions, like the picture of the Bengali sweatshop with an empty space at the centre, or of the woman holding up a mirror whilst trying on a wig in the market – only it is her friend’s face that is revealed to the camera. “I’m just the kind of guy who needs to take pictures,” Homer Sykes admitted to me with a shrug, yet the serious and soulful body of work he has done belies such levity, even if it is characteristic of the spirit of the man. Marvellous photographs Homer. Many thanks. Such astute observations captured ever so artistically. I am a life-long devotee of the greasy spoon, but I should like to content myself by believing that the old gent in the apron & hat is actuallt taking a well earned break from washing the pots rather than dabbling in Haute Cuisine! Mind you…. Fish & chips at 29p… I might just risk it! Fantastic picture of the garment factory. I remember growing up in the East End of London, and visiting places like this. Life was hard for recent immigrants with both the wife and husband working long hours in terrible conditions. Wonderful shots and history. Love mono as I am the same and love street photography, it can be dodgy on the street if someone spots you. I try to use the sympathy vote as I’m 68 and have Parkinson’s, It usually works. The fourth picture is of great eastern buildings. The girl looking out of the window is my cousin, Jackie. Its around 1970-72. If anyone knows of people who lived there during the 60s I would love to hear from you. I am writing a piece on life in the buildings. We are not allowed to place our email addresses here but if you respond to this message, maybe the gentle author will put us in touch? Dear Steven Harris, I have just seen your comment on my photograph, ” … is my cousin Jackie … “. I would very much appreciate you getting in touch with me please, I am easy to find on the internet. 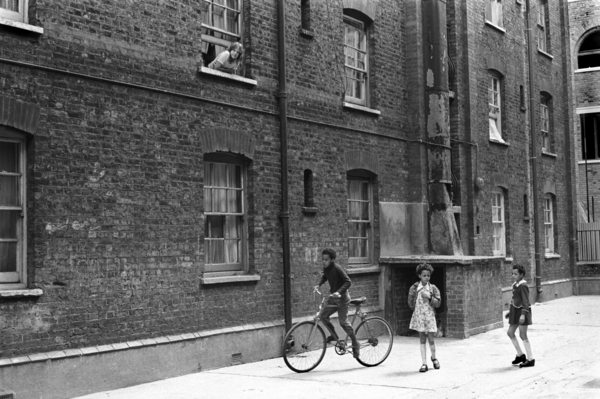 I would like to be able to add your cousins name to the picture caption on my website and clarify if these building were indeed part of the Peabody estate. Perhaps the Gentle Author would pass this message on to you. 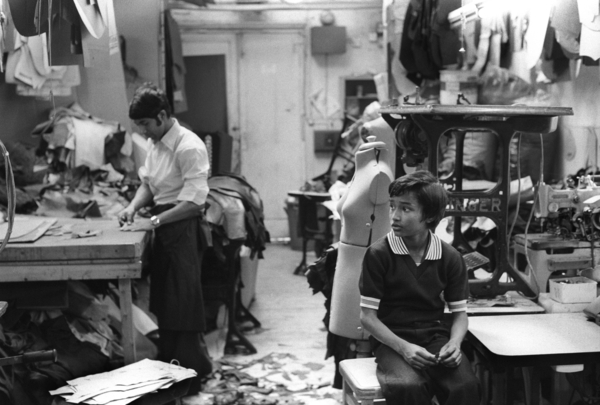 about the Garment factory shot (from 1978, we worked it out). Anam (his nickname was Bruce, after B Lee) asked me for a copy this summer when we had a 70-80s reunion. Of course he is now much older and not in Esat London. How could he get a copy of this. I saID i WILL FIND OUT. Raju, please get in touch with me, I am very easy to find on the web, type Homer Sykes, and at the bottom of each page is a “contact” link.